Last Monday I went to the open air textile market. It's kind of an interesting market and is only open the 1st Monday of every month. I have been there before so I pretty much knew what to expect. I really wasn't looking for anything in particular I just wanted to get out of the house and be outside for a little while. The textile market sells things like fabric, clothes, cookware, gadgets, tablecloths, curtains, etc...As I walked around I looked at the things for sale and some some really pretty Upolstry fabric that would be good for the dining room chairs I have in my house. Of course I really don't know how much fabric even to buy so I just admired it and moved on. Then I noticed a stand that sold nothing but underwear. Mens and women's underwear. I started thinking who comes to the open market for underwear? Are they just waiting for that first Monday of the month and say to themselves, "I better get to the open market to buy my underwear." It seems kind of like a personal item to be buying at the outside market but I suppose they have good prices. I passed several tables that sold just underwear and yet there was never anyone browsing around the table. I'm sure people must come and buy it otherwise there would not be multiple stands of underwear. Strange. 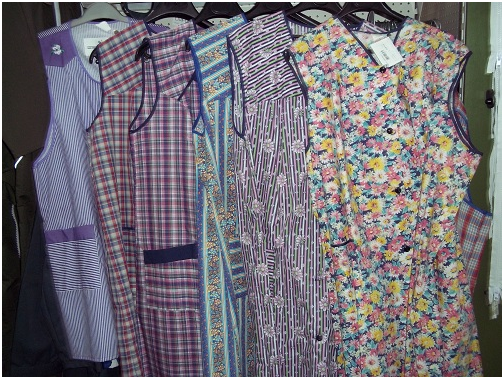 The other stand I found humorous was the house coats for sale. 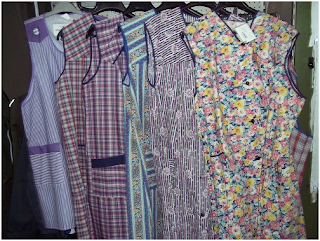 These are not robes but house coats that women sometimes wore in the 50's to clean their house in. I didn't even think these things existed anymore and yet, here were some racks of them. Who in the world is wearing these things? Someone is, otherwise they would not be selling them. In the end I ended up with only one thing from the textile market and that was a rubber sink stopper. I think I accidentally threw mine away and so wanted to replace it. The problem was I wasn't sure what size to get as they came in all sorts of sizes. I finally just had to estimate and bought one I thought would fit. It didn't. Oh well it was only 50 Euro cents. It does keep the water in the sink for a few mintues but eventually it all drains out. Oh yea, I did buy was a vintage tablecloth--but I didn't buy it at the open air market. On our way walking to the market we stopped off at an antique store and poked around a little bit. I found some cute little square tablecloths that had been hand embroidered and I bought one. It was only 5 Euro and I think it will look cute on my table. This whole experience was just so German. I always find it interesting the way German's do things and I find myself saying, "That's so German!" They love their open air markets so they can buy their underwear and other household items. (Germany has to be the worst place for open air markets because the weather stinks most of the time) Here are a few, That's so German things I've noticed. They love to open their windows even when they are having an Arctic freeze. Often I see their comforters and blankets hanging out the window to air out. Today we had a cold front come in and it's pretty cold outside. I wondered if I could find any windows open so I walked outside and both my neighbors had their windows open. They love to paint pictures on their homes. Here is a picture of the house up the street from our house. I think if someone painted this on their house in the states there would be someone complaining how it offends them in some way or another. I'm not sure who this crowned person is but maybe it represents the fact that whoever lives there is King of his castle! The Germans also love to get their homes blessed. You can tell the homes that have been blessed by the cryptic white chalk writing on the top of their doors. The German's made a law, at least that's what I was told, that you can't park your car up on the curb or sidewalk and yet everyone has to do it or your car will be totaled because of the narrow streets. Here is a street around the corner from my house where the people have resorted to parking completely on the sidewalk because as you can see if they parked in the street it would totally block off the street because of the car that is parked on the street. There are so many things that I could say, That's so German but perhaps it's more European than anything. Whatever it is, I like it as it entertains me on a daily basis.